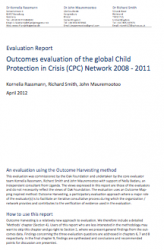 A. Assess the results of the CPC Learning Network in relation to three themes: (1) the extent to which structural and process changes did or do facilitate learning, (2) CPC’s influence on CP policy and practice, and (3) cast a spotlight on CPC's standing within the child protection landscape. B. Contribute to organizational learning: participation of network focal points in the process of generating evidence as well as in using the findings was intended to provide new insights into the effectiveness of the network and the roles of CPC’s supporting entities – the Global Secretariat, the global Task Forces (TFs), and the national Programme Learning Groups (PLGs). The evaluation put forth some suggestions for the CPC network and concluded that from 2008 to 2011, the CPC network succeeded to advance its strategic planning, build relationships, increase membership, design and where desired re‐design its processes, structures and governance mechanisms – while at the same time progressing its purpose.